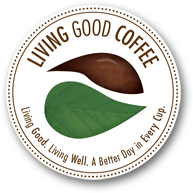 At Living Good Coffee, our company is all about healthy living and bringing a healthy lifestyle into your home. We are an innovative and health conscious company that produces only the highest quality coffee products for you to enjoy. Our first product that we will be introducing is our Super Antioxidant Coffee line. Did you know Super Antioxidant Coffee has six (6) times more antioxidants than your regular cup? Our triple patented Healthy Roast ProcessTMcreates a unique technology that avoids destroying the antioxidants during the traditional roasting process. This method does not change the profile or taste of our coffee. We only use US certified organic Arabica beans and is produced in ways that are GOOD for the environment, wildlife, workers, and local communities. What makes Super Antioxidant Coffee so healthy? The Healthy Roast ProcessTM offers a uniquely healthy, delicious robust cup of coffee because it has more antioxidants than any other coffee than most foods. Developed by a team of food scientists at Applied Food Sciences, Inc., Super Antioxidant Coffee retains the powerful polyphenol antioxidants present in the raw, green coffee bean. Traditional roasting process roast out the significant antioxidants out of the coffee during the roasting process, while ours retains these powerful antioxidants. Through our patented Healthy Roast Process, we are able to offer the enormous world of premium coffee drinkers a delicious and HEALTHY cup of coffee! One of the world’s greatest food science teams has spent the last seven years perfecting a patented method of replacing the valuable antioxidants that are removed from other premium brand coffees during the roasting process. Introducing Living Good Coffee…a great tasting premium healthy coffee…the latest in coffee innovation! Now you can enjoy your coffee and lose the guilt! How? First off, we import high quality raw, green Arabica coffee berries that are handpicked in Costa Rica and shipped out to our special roasters. These beans then undergo a special roasting process, a technology that retains the healthy nutrients and antioxidant properties of the beans as compared to a traditional roasting process. The result is a healthy coffee that is packed with antioxidants only found in our coffee beans! Go ahead and compare our healthy roasted beans with that of a traditional roasted beans and you can visibly see the difference!